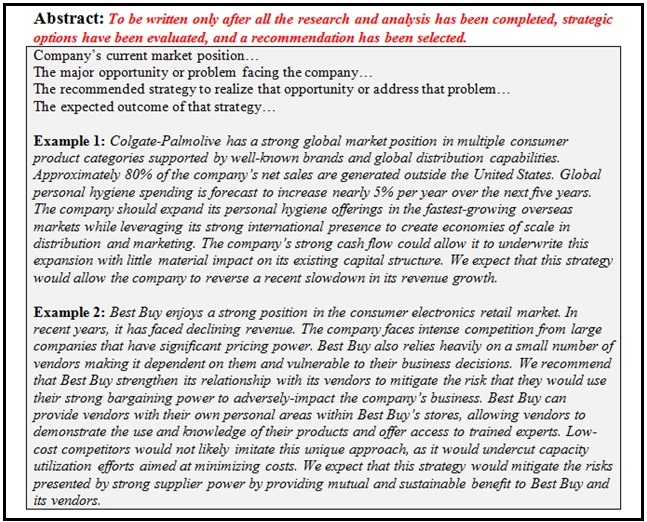 In my May 25, 2015 blog entry, I discussed the research paper that I regularly assign my BBA 407 strategic management students. In that discussion, I noted that students who took advantage of receiving frequent feedback as they conducted their research and drafted their paper typically did better than those who did not solicit such feedback. As a result, I stated that I would develop a research paper template that I would introduce during the fall 2015 semester. My goal was to provide students with a framework that would allow them to better structure their research, analysis, and writing. The template has been posted on Blackboard and was discussed in Thursday’s opening class. All students are required to complete and submit their templates with their papers. The template is broken into two components. The first part of the document contains explanations, guidance, and examples. The second part is the template that will be completed by the students as they research and write their papers. Guidance for developing a robust analytical framework. Components include a SWOT analysis, the Porter Framework for industry structure and profitability, questions that should be addressed in a financial analysis, charts for evaluating a company’s financial strength and trends internally and against the industry and/or major competitors, an analytical summary linking the company’s competitive position with key drivers and changes in those drivers, guidance for developing a strategic focus, guidance for determining how the company should pursue its strategic focus, and an evaluation of possible strategic options. Those components are based on outcomes from past student work, common deficiencies in papers, and elements of the strongest papers. Overall, the development of corporate strategy is a rigorous evidence-based approach. Moreover, strategy does not occur within a vacuum and/or unchanging environment. A company is essentially one member of a larger industry ecosystem. Its choices will have an impact on an industry. In turn, its choices lead its competitors to respond and/or competitor choices lead a company to make its own responses. At the same time, an industry is in a continual state of flux, both from internal factors and external ones. The template is designed to help students gain a larger, but more focused overview and more robustly analyze options, trade-offs, and feasibility. If the template is effective, the advantage between students who seek regular and early feedback relative to those who do not should narrow. This entry was posted in Teaching and Learning and tagged analysis, development, research, research paper, strategic management, students, Teaching and Learning, writing on August 31, 2015 by Don Sutherland.